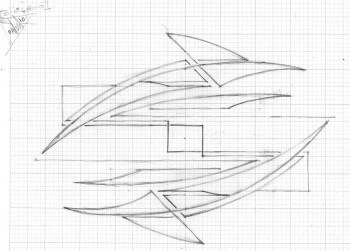 As with almost all of my work, the idea for this piece began as a small, abstract pencil doodle. Once the doodle was completed it struck me that the figures were reminiscent of orcas (killer whales). While I do not generally create "northwest" themed artwork, there was something about this doodle that seemed appropriate to that region of our country. I began to think of this as a composition that might be perfect for a stained glass panel. Glass Eye 2000 was ideal for exploring this notion. It permitted me to experiment and explore various glass colors while keeping in mind the black-and-white coloring of the orca. And being an abstract composition, I felt free to employ a bit of artistic license with the color composition. The final construction is a panel measuring approximately 26" x 21". I also added a 1" oak frame to finish the composition. 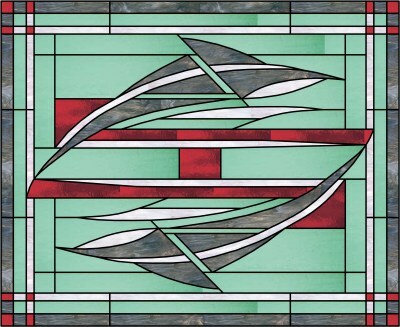 The sharp points of the design were a bit problematic, but also resulted in the final breakup of the glass background into smaller size glass. Most of the glass was from Spectrum; however, I happened upon a greenish glass manufactured by Fremont Antique Glass in Seattle, and it became the perfect background for the design. This is a copper foil panel, and I used reinforcing along several of the joints because I was concerned about fragility of the pointed and thin long glass pieces in the work. You'll notice in the photograph a blue tint in the upper figure. The glass itself has almost no blue; the color comes from the sky and from light refractions. The changing colors that result from differing light conditions are one of the reasons we love the art of stained glass. Don spent most of his 30+ year career as a pragmatic, technically-oriented architect (as distinct from a design-oriented architect) who took the concepts of others and made them constructible and enjoyable to inhabit. 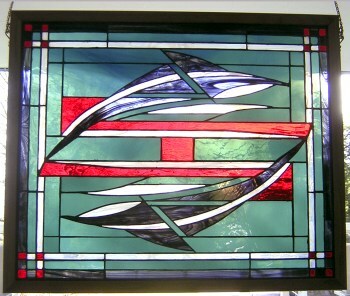 Although he has always loved stained glass, he has been exploring this interest for only two years.